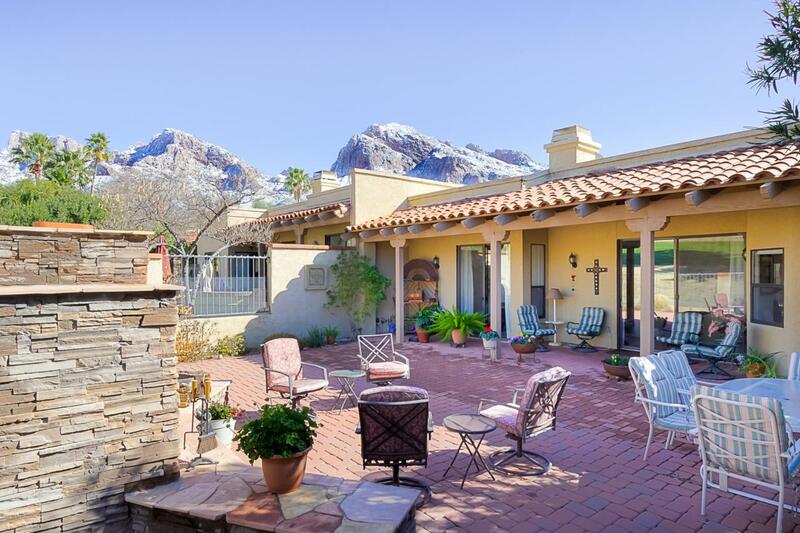 Totally remodeled & updated 1,607sf 2BR/2BA patio home located at El Conquistador Resort on the 3rd Fairway of the Pusch Ridge Course, adjacent to Hilton Golf & Tennis Resort. Kitchen has newer cabinets w/full extension drawers, granite counters, stainless appliances, casual dining nook, large Chef's island w/breakfast bar; the gathering point of the kitchen & great room. Formal dining area has sliding glass door to private patio. Solar Tubes, Skylights, Hunter Douglas Blinds, ceiling fans, Oak wood flooring. Carpet in BRs. Updated Bathrooms w/executive height vanities. Covered extended rear patio w/paver brick, stacked rock wood-burning fireplace w/fairway & mountain views. Golf, Tennis, Shopping, Dining, Oro Valley Marketplace, Theaters, Catalina State Park & Aquatic Center all nearby.